The leaving of visiting cards was a prevalent feature of Victorian society and life. Visiting cards were an essential accessory to any proper Regency or Victorian lady or gentleman and served not just as a letter of introduction or aide memoire, but as an indicator of social class and good manners. In those days a card case was as essential an article of personal equipment as was the cigarette case was in the 1950s and 1960s. Few upper and middle class men and women were without one a card case, and they were designed and manufactured in all manner of materials and styles. 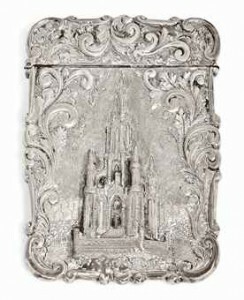 Pictured: A Victorian Silver Card Case – Mark Of Nathaniel Mills, Birmingham, 1845 Cover decorated in high relief with the Scott Memorial, reverse chased with foliate scrolls around a cartouche inscribed Mary E. Farnsworth 3½ in. long (8.8 cm.). Sold for £813 at Christies, London, Dec 2013. Image Copyright Christies. Silver card cases were manufactured in great variety, usually elaborately engraved or embossed, the highly decorative treatment of initials or monogram often a distinctive feature. Highly collected are those of architectural views, collectively known as “castle tops”. Card cases for gentelemen tended to be smaller than those of ladies. Occasionally one comes across a tiny silver case no larger than a lady’s visiting-card, with side chains and a ring attached. It was made for suspending to that one-time fashionable adjunct of a Victorian lady’s outfit, a silver chatelaine. As with vinaigrettes Birmingham was a key area for the manufacture of silver card cases with noted makers including Joseph Willmore, Taylor & Perry, one of the leading designers Nathaniel Mills. 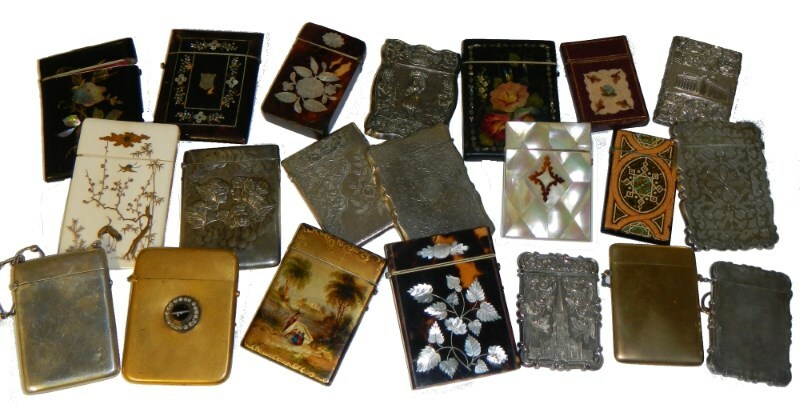 Victorian card cases were also made tortoise-shell and mother-of-pearl and many show their daintiness and superior workmanship to the immense charm and interest inherent in many things Victorian. The middle of the 18th century ushered in a fashion, borrowed from the Continent, for cartes de visite adorned with a picture or engraving, perhaps portraying a classical or mythological figure, or depicting views of different towns or famous monuments; perhaps displaying a simple floral motif, swag or festoons. As time went on the standard of design and workmanship deteriorated. The vogue for this sort of card declined, giving place to the plain Victorian visiting card bearing merely name, or name and address in a variety of styles of printing or engraving, a type still surviving in what cards are used at the present day. It is a moot point whether Beau Brummell or the Royal Family set the fashion for this unadorned variety. Simple and austere as the cards were, the art of using them was ordered by a rigid and complicated code of etiquette which it believed the socially ambitious to master, or else suffer the humiliation of rebuff or disregard. The earliest card cases were made with a pull-off top in contradistinction to the hinged lid of later varieties, including the deeper, more roomy type with a two-hinged lid, and interior of concertina-like folds of stiff paper, silk or satin, forming several compartments for the cards. Perhaps the most strikingly attractive line, and one turned out in great numbers, was the case made of mother-of-pearl or nacre, small diamond or rectangular shaped pieces of which were fitted together, completely covering an underlying structure of thin wood. The nacre was used in a variety of ways— sometimes alone, its decorative value in its high irridescent gloss; sometimes in two shades—light and dark—making a wonderfully arresting contrast; sometimes combined with tortoiseshell; sometimes with silver introduced as corner or side embellishment, or centrally as an escutcheon for initials. Cases of tortoiseshell were legion—light, dark, plain, fluted, banded with ivory, silver or pewter; some bore a celluloid monogram in high relief, in colour to tone. Perhaps the most interesting class in this material were cases with designs of mother-of-pearl inlay, often in conjunction with gilt wire. Among this type were many of superior workmanship, and exceptionally charming design. A case with a dark tortoiseshell background would feature an all-over grape-vine pattern in which tiny bunches of grapes and vine leaves were in inlay of contrasting light pearl, stems and tendrils of twisted gilt wire. The result was most decorative and attractive. 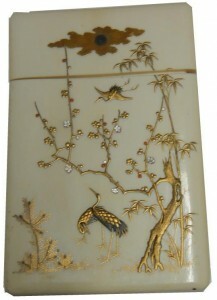 Ivory cases were a strong durable line, their styles mostly severely plain, intricately carved, or with a design delineated in tiny gold points in the manner of pique work. Synchronous with the popular demand for card cases was the great 19th century innovation of papier-mache. Many cases of this, then novel, material were made, their decoration in character with that of other papier-mache objects of the period-gaily painted landscapes and flower motifs, exotic birds, playing fountains, etc., or in the true Victorian tradition, inlaid with mother-of-pearl, usually enhanced with skilful gilding. In Victorian times travellers abroad would often bring home as souvenirs card cases of work peculiar to the countries visited; of metal filigree, for instance, from the Canary Isles, the patterns in wire tracery similar to those of the well-known Tenerife lacework ; of sandalwood from India; of elaborately carved ivory and tortoiseshell from China and Japan; specimens from Persia in beautifully carved cedarwood enriched with fine native mosaic-work. From time to time cases of other materials crop up, e.g., those showing the work of the accomplished fingers of the Victorian needle-woman, in beadwork, petit point, Berlin woolwork and other embroideries fashionable at the time. For several decades following the obsolescence of the fashion, card cases seemed to fail in any serious appeal as collectors’ pieces. No longer serving a utilitarian purpose and with many specimens of fragile construction, they tended to be regarded somewhat as unwanted bygones— a drug on the market, so to speak. Nowadays, in their distinctive Victorian charm, their great variety, and speaking as they do of an elegant facet of more leisurely days of last century, far from being allowed ignominiously to disappear from the artistic scene, they have caught the attention of the connoisseur to become a most fascinating collector’s item in Victoriana.